These are not heated, and ideally the water temperature should vary to the same extent that it does in nature (from 5 to 25°C, approximately). This is difficult, as room temperature barely falls below 15°C and is often over 18°C. Apart from this difference, the underlying principle is the same as in any aquarium: to recreate an environment. This demands just as much time and care as with tropical aquariums. It must be stressed that we are not talking about goldfish bowls! Temperate aquariums house robust species, among them the fish found in our rivers and ponds, which fall beyond the scope of this book. On the other hand, we will cover goldfish (Carassius auratus), all too often neglected in favor of tropical species, but which, in their innumerable variety, give great pleasure to many hobbyists. Still within this temperature range, mention must be made of garden ponds, where goldfish and koi carps (colored varieties of the common carp) can be kept and bred. 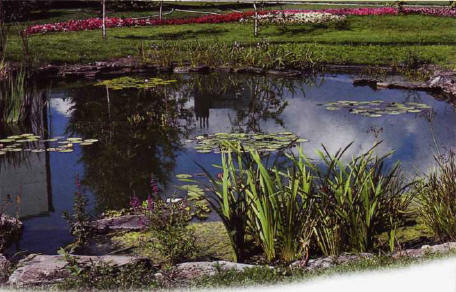 If they are well designed, such ponds can recreate a natural biotope, with aquatic and terrestrial plants, invertebrates, and amphibians. Sometimes they can also play host to tropical fish for a brief summer stay, if the temperature permits. After all, fish can take vacations too, especially if they coincide with yours! It is a practical solution when there is nobody to look after an aquarium during a long absence, and when you come back you may be amazed by the weight the fish have put on, or by some unexpected new arrivals. On the other hand, do not be too surprised if some fish have disappeared, unable to tolerate the change of setting - or the predatory instincts of the local cat. ЩАРА , река в Белоруссии, левый приток Немана. 325 км, площадь бассейна 6990 км2. Соединена Огинским каналом (не действует) с р. Ясельда (бас. Днепра). Шлюзована на 220 км.